So you’re moving into a new apartment with a living area that’s a little snug, and need to figure out the right furniture layout? Let’s see if we can help some. That’s the side of the living area that is closest to the main entry. This next photo is looking across the room, and the kitchen is to the right before the dining area. Great, big, windows by the way. We don’t have all the measurements or much sense for style preferences, but here goes. The first thing to do is envision how you would use this space. How many people do you want to fit comfortably, and what activities do you want the space to function for? Ashley wants a space that will allow them to entertain, but most importantly that will be functional, cool, and comfy. 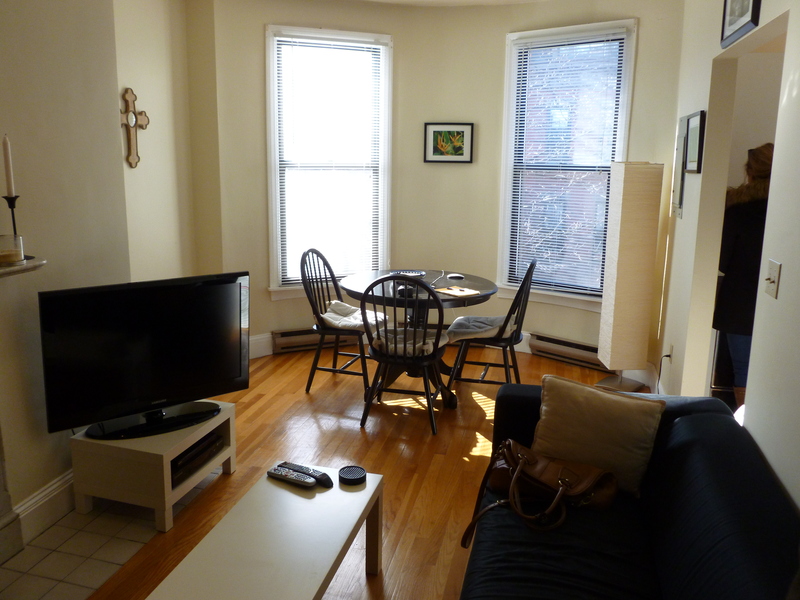 They own a 47″ TV, which needs to be considered when determining the furniture plan. A TV this size typically requires a minimum of 6 feet viewing distance, but preferably 9 feet. With a total room width of 9 feet (fireplace wall to opposite wall), if you are looking for *optimal* viewing that means the TV would flip to face the length of the room since you need to factor in seating, fireplace, etc. This plan places the TV to the left upon entry to provide optimal viewing distance from a couch. 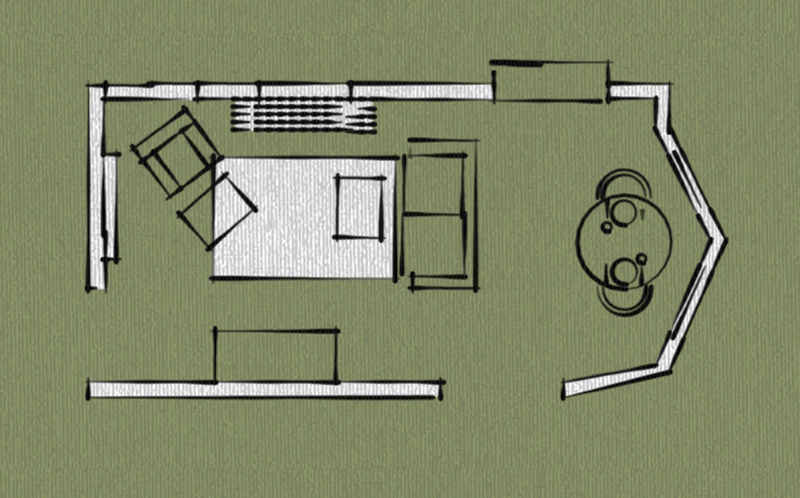 With this plan you can see the TV from the couch and dining area, if that is desired. In any plan it is really important to consider the main circulation path, which for this room is from the left entry to the kitchen entry (right, before dining area). 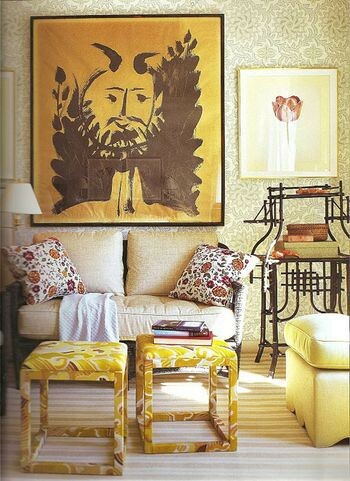 It is also important to create a conversational arrangement where chairs and sofas face into each other. If you need additional seating you could place a small profile bench along that circulation path with some throw cushions, or even a few movable ottomans which won’t be too intrusive. The bench could also have storage underneath. Here is another plan with the TV left. 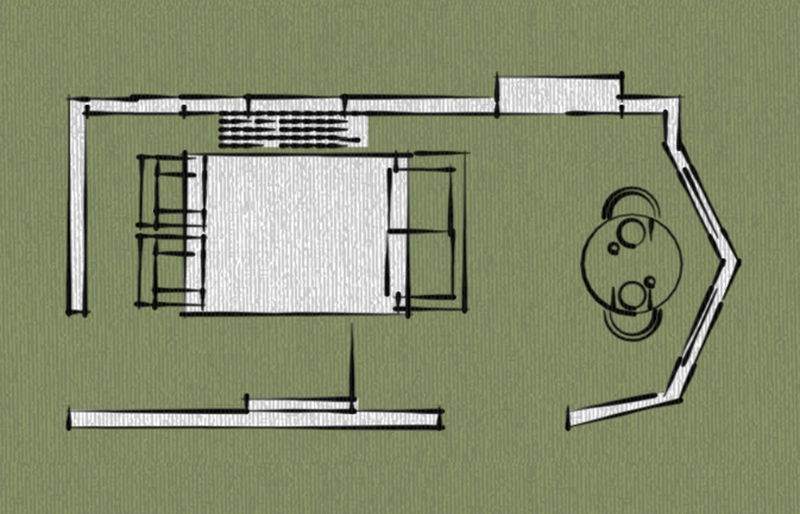 This plan also places the TV left, with 2 chairs flanking the fireplace and a couch opposite. This plan does not provide optimal viewing of the TV for most of the proposed seating. This is OK if the TV is not to be the focus of the space, but rather you want a comfortable conversational arrangement and to maintain an open feel between the dining and living areas. That is a good consideration if you entertain more people and some will overflow into the dining nook. Here’s a third plan that keeps the TV facing the length of the space, but now it’s on the right side. 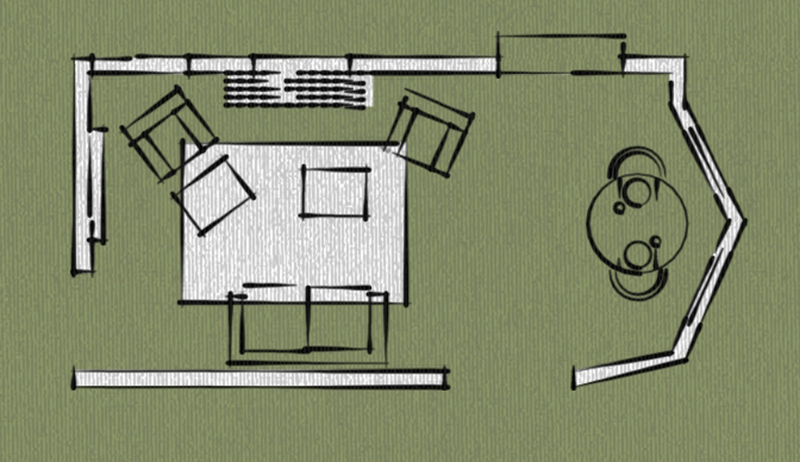 This plan offers a clear divide between the dining and living areas, keeping the TV facing the length of the space. Create division between the spaces with an interesting TV stand. 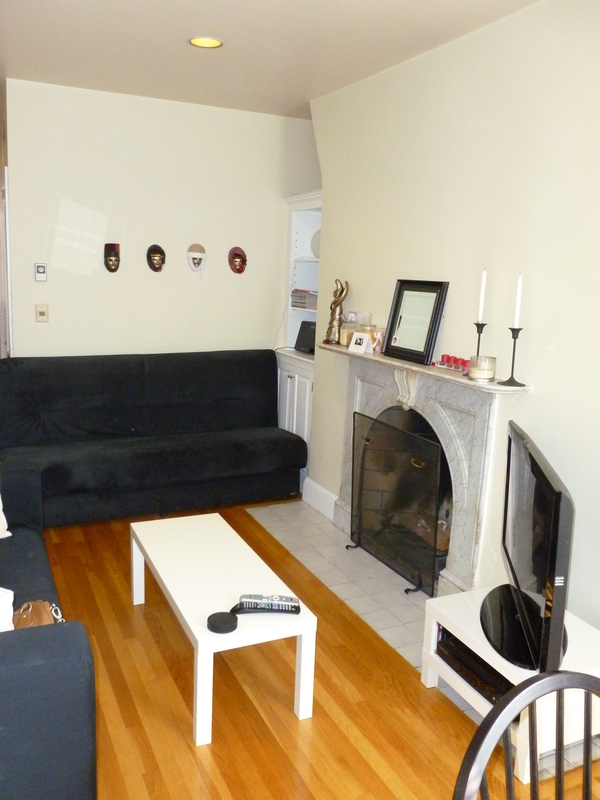 The final option is to flip the TV to the right upon entry, placing it opposite of the fireplace. This would allow you to enjoy both the fireplace and the TV, but consider that the seating arrangement will require you to turn your head to watch TV unless you are lying on the couch. 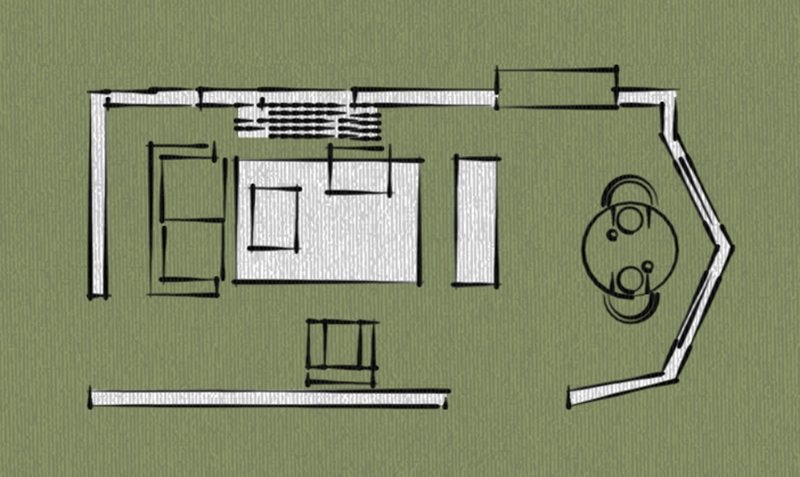 This plan places the TV opposite the fireplace. You could do 2 couches facing each other, or 1 couch and 2 chairs, or 1 couch and 1 large chair. 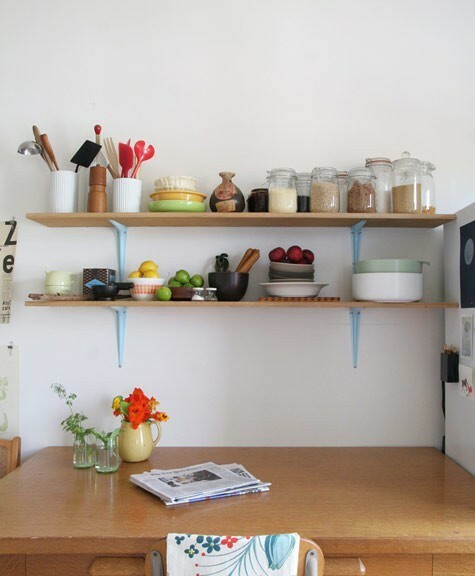 It all depends on what would be most functional for your use of the space. The biggest thing you need to consider with this plan is how you will handle your TV components. Since this is a main circulation path you really should maintain a 3 foot path. If you put the TV on that right wall then you need to consider how far the TV will jet into this walkway even if mounted on the wall, what you will do with all of your components (do you need a stand, too), and how annoyed you will be when everyone walks directly in front of the TV to go in and out of the room. At this point we would want to hear from you as to what plan best accommodates your preferences and how you see using the space. Each offers its pros and cons, so which do you think would be most functional? You may be asking why we don’t propose to put the TV over the fireplace so everything is on one wall. It’s not a stellar idea, especially in a space this narrow and with that size TV. We guarantee an instant and painful neck strain if you do it. When you are seated you should be comfortably looking straight ahead, not up. Now let’s talk furniture. Given the size of this space, we have proposed loveseats for couches. Somewhere around 5′ is most ideal, a little bigger would be OK depending on the final configuration. The style you pick is also important – a tailored look and smaller profile will really help in making the space feel larger. Chairs will depend on which plan you go with. Side by side chairs should be smaller profile, but if you pick a plan with single chairs you can go larger and more comfy. You could even consider a smaller rocking chair. Using ottomans is going to be key in this space as they can be multipurpose – additional seating, coffee table, leg rest (necessity with small sofas). 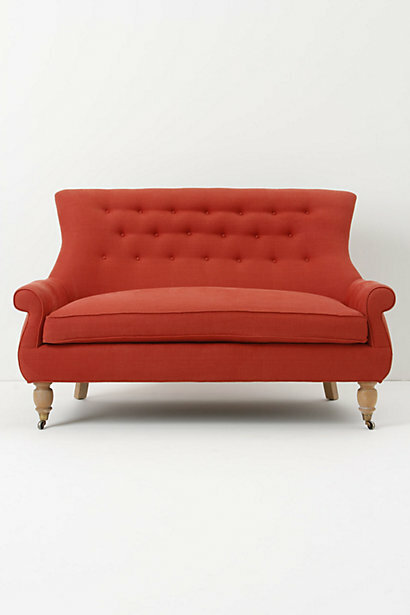 You could do something like this pouf from West Elm. 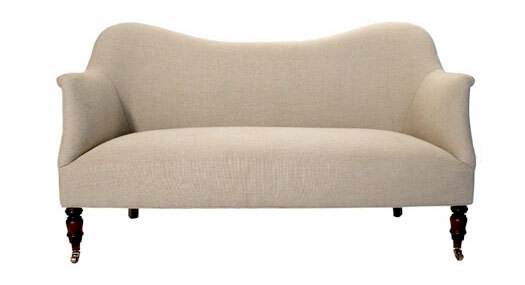 Or an upholstered one with legs. You could even throw some floor pillows in there in front of the fireplace to soften up that tiled hearth. And place a mirror above the fireplace to create a larger sense of space as well as add a place where light can bounce and reflect (also note shelves here which we will get to). Use a rug to define the living area space, but don’t allow the edge of the rug to intrude into the circulation path. Either have it cover the entire path, or stop just short of it. 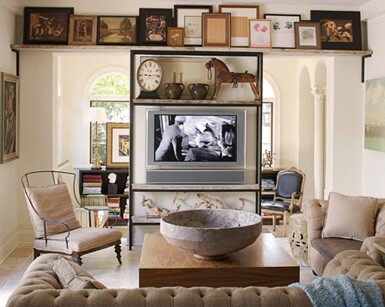 And lastly, for that recessed area over by the dining area we love the idea of built in shelves for additional storage. There are a few fun options. You could paint or wallpaper the back wall, and/or paint the shelves. Place them in a random pattern like this. Or mount them straight across. You can go to home depot and have them cut boards to the exact size, and then mount them with brackets (go find some salvage ones and paint them, or Ikea has lots of cheap options). You could also use hardware that will allow them to appear as they are floating. 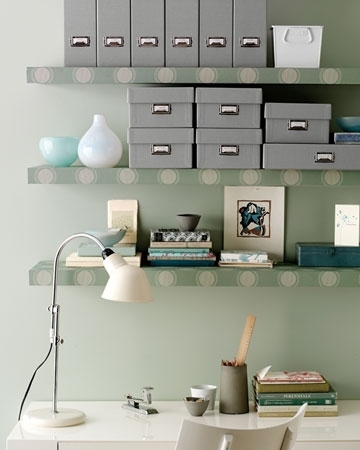 Or how about wallpapering the shelves? Consider even making that little nook a desk area, if you need one. OK Ashley, so hopefully we gave you some ideas and we can’t wait to see what you come up with!! Does anyone have a favorite plan? Holly! This is amazing, thank you so much! I think we’re going with the TV opposite to the fireplace with a loveseat and comfy chair. 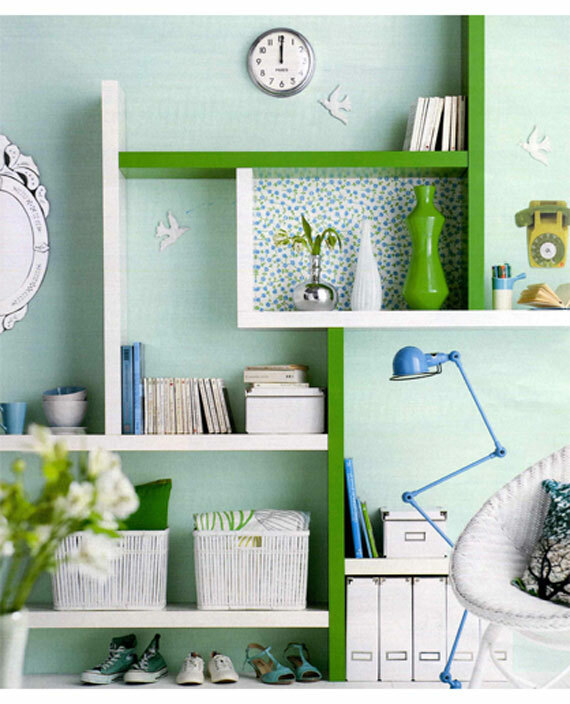 I love the shelving decoration idea, will definitely look into it. Thanks again, this post is fantastic. I knew you were the one to talk to.